The body design and construction of a pickup has a huge impact on how well it performs over the long term. 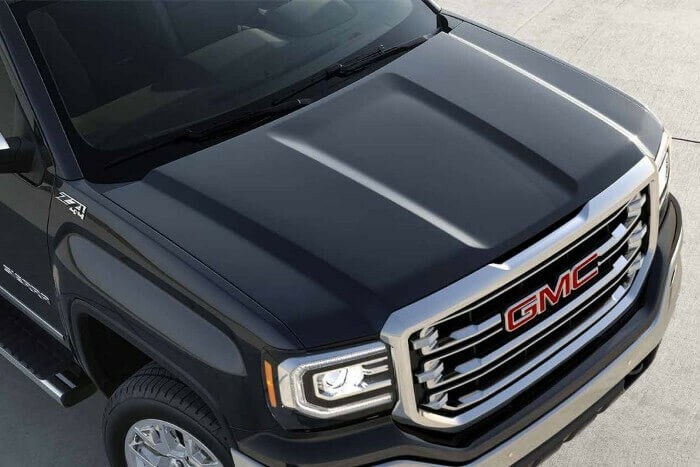 A well-rounded pickup needs to boast more than just performance capabilities, and the 2018 GMC Sierra 1500 exterior has been carefully crafted to accomplish any job you send its way. It has rugged style, work-ready durability, and features designed to make heavy-duty travel easier. If you want to take on St. Augustine in an aggressive pickup that’s up to a challenge, this one is a top option. Visit Nimnicht Buick GMC in Jacksonville to get a closer look the Sierra 1500’s impressive exterior. This pickup makes its presence known thanks to a bold grille design, a singular cutout above the grille, and distinctive wheel openings. There is nothing else on the streets of Orange Park that looks as bold and tough as the Sierra 1500. You can shine light on any situation thanks to LED head and taillights, cargo box lighting, fog lamps, and intelligent high beams. Work doesn't have to stop when the sun goes down. Three bed options are available, each with a corner step rear bumper for easy entry. There are also eight total tie downs, an available spray bed liner, and even a remote locking tailgate to make hauling as easy as possible. This options package upgrades the look of the pickup significantly thanks to a unique grille, a bold monochrome color scheme, 20-inch wheels, and thin-profile LED foglights. You can upgrade the look and feel of this pickup even further with two other available options packages. The All Terrain Package adds 18-inch machined aluminum wheels, all terrain tires, an underbody shield, and other enhancements designed to take you off-road. The All TerrainX Package includes everything in the previous package and adds black painted wheels, a black sports bar, and black sport assist steps. With either of these packages equipped, the Sierra 1500 becomes a beast to behold. Thanks to next-generation technologies and refined performance, the 2018 GMC Sierra 1500 does what other pickups cannot, including the Ford F-150. If you are ready to have an uncompromising vehicle at your disposal, check out the inventory at Nimnicht Buick GMC. Our local dealership has all the resources you need, including accessible financing offers. Feel free to contact us with your questions.